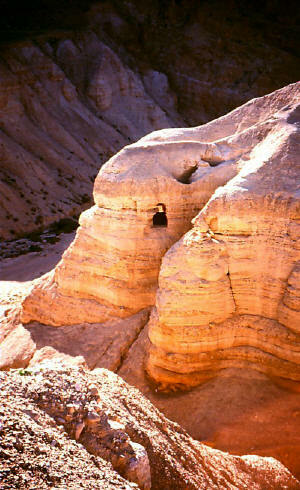 Some of the caves in the sandstone cliffs at Qumran near the Dead Sea, where the first scrolls were found hidden. About 1900 years ago, religious zealots living in an isolated desert community near the Dead Sea sealed some of their sacred writings in clay jars and hid them in isolated caves in the cliffs. These writings remained undisturbed until 194 7, when a Bedouin shepherd boy rediscovered them. It was the most exciting archeological find of the 20th century. The Dead Sea Scrolls is the name conventionally given to a group of scrolls mainly found in 11 caves near the site of Qumran, but with a few also found at other sites near the Dead Sea, such as Masada, Nachal Hever, and Murabba‘at. These scrolls were written on animal hide or papyrus and contained three types of material: copies of the Hebrew Scriptures, works from what scholars call “apocrypha” or “pseudepigrapha,” and documents pertaining to the Qumran community itself. in the validity of the Hebrew Scriptures common to Jews and Christians, further our understanding of early Judaism, and deepen our background knowledge of the New Testament. In this article, we examine five ways the scrolls have contributed to our understanding. One paper I worked on as a doctoral student compared the numerous scrolls in cave 4 of Qumran containing parts of Deuteronomy to the text of Deuteronomy found in Codex Leningradensis. This codex, dated a.d. 1009, is the oldest surviving complete Hebrew Bible. 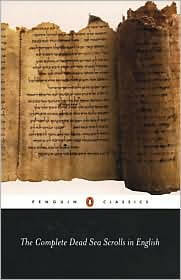 I found that several scrolls from Qumran dating between 125 and 25 b.c. differed at the letter level from Codex Leningradensis by 1 to 4 percent, and most of these changes were only spelling differences. Moreover, one manuscript, 4QDeutg, the seventh Deuteronomy manuscript found at Qumran, was letter for letter identical with Codex Leningradensis. My findings only confirmed what other scholars had shown. The Dead Sea Scrolls had established the antiquity of the Masoretic Text, the tradition of the Hebrew manuscripts painstakingly copied by the Masoretes for centuries. This text underlies the printed Hebrew Bibles used by Jews today and most modern translations used by Catholics and Protestants. In addition to several Deuteronomy scrolls, other Dead Sea Scrolls of Isaiah, Jeremiah, and the Minor Prophets attest to the antiquity of the Masoretic Text. We now have documents with the same basic text as used in our Bibles that are over 1,000 years earlier than any previously known. Almost everything we find in the hundreds of biblical Dead Sea Scrolls is contained in the Masoretic Text, or the somewhat different Septuagint Greek text, or the Samaritan Pentateuch. The biggest exceptions are a mere two verses worth of material in 1 Samuel previously known only in Josephus, and a verse in Psalm 145 that also occurred in a couple of medieval manuscripts. We can have confidence, then, that very little has been lost or altered in the last 2,000 years of transmission of the biblical manuscripts. a.d. The Dead Sea Scrolls were discovered about the same time as the founding of the modern state of Israel, the only state that has Hebrew as its official language, and the discovery was one factor in helping the fledgling state form a Hebrew identity in continuity with its past traditions. The Dead Sea Scrolls were written before the New Testament existed and do not mention Jesus or the apostles. However, they frequently provide background information that illuminates our understanding of the New Testament. For example, in Luke 7, John the Baptist asks Jesus if he really is the Messiah. Jesus replied: “Go back and report to John what you have seen and heard: The blind receive sight, the lame walk, those who have leprosy are cured, the deaf hear, the dead are raised, and the good news is preached to the poor” (Luke 7:22). Until the discovery of the Dead Sea Scrolls, the connection between this list Jesus mentioned and what was expected of the Messiah was unclear. However, 4QMessianicApocalypse specifically lists healing the wounded, opening the eyes of the blind, raising the dead and preaching good news to the poor as the things that the Messiah would accomplish. This, then, is proof that Jesus claimed to be the Messiah — contrary to the opinion of many New Testament scholars before the Dead Sea Scrolls were found. The scrolls also provide background to the book of Revelation. Like the early church, the Qumran community was a marginalized Jewish group who looked forward with hope to God’s end-time judgment upon the world. In the New Testament, this is particularly expressed in the book of Revelation, an apocalyptic work. The Dead Sea Scrolls also contain apocalyptic works such as Aramaic Levi, five Enochic apocalypses, The Vision of Amram, Jubilees, Apocryphon of Daniel, and The Four Kingdoms. These apocalyptic works, in addition to other scrolls with thematic connections to Revelation, such as the War Scroll and the New Jerusalem Texts, vastly increase our background knowledge to the last book of the Bible. a.d. 70. According to almost all scholars, this community belonged to the Essenes, a Jewish sect briefly mentioned by the historians Josephus and Pliny the Elder. The scrolls, therefore, give us much information about the Essenes but also additional knowledge about other groups that the Essenes reacted to or interacted with, such as the Pharisees and Sadducees mentioned in the New Testament. For example, five documents among the scrolls label the Pharisees as “those who look for smooth things” (they were less strict in certain ways than the Essenes) and accuse them of misinterpreting the law. The Old Testament typically found in Protestant Bibles contains the same books, although in a different order, as the books of the Hebrew Bible used by the Jews. Catholics, Eastern Orthodox churches and Oriental Orthodox churches have additional books in their Old Testaments, and scholars call these additional books deuterocanonical, apocrypha or pseudepigrapha. Prior to the discovery of the Dead Sea Scrolls, these works were almost entirely known only in Greek, Latin or other translations. The same scroll that contained this psalm, 11QPsa, contained two other Hebrew psalms previously preserved only in Syriac by the Syriac Orthodox Church, and three completely unknown psalms. As a side note, I had the privilege to study the Dead Sea Scrolls under James Sanders, the scholar who unrolled 11QPsa and produced the critical edition of it. preserved by the Catholic, Greek Orthodox, Syriac Orthodox and Ethiopic Orthodox churches, etc. is of great antiquity, and that much of it was originally written in Hebrew or Aramaic. Whether one calls these works deuterocanonical, apocryphal or pseudepigraphal, the Dead Sea Scrolls have shown that there is much to value here. it disturbing, and wonder if we have been told the whole story. Because it took several decades before all the scrolls were published, some people speculated that truth damaging to the claims of traditional Christianity was being suppressed. Now that all the scrolls are published, we can see that the opposite is the case. They provide evidence that the information contained in the books of the Bible has been handed down accurately, and can be trusted. Timothy D. Finlay earned his Ph.D. at Claremont, where the Ancient Biblical Manuscript Center housed, with the agreement of Israel, a complete set of photographs of the Dead Sea Scrolls before they entered the public domain. He first saw the scrolls themselves in Israel in 1997, and throughout this autumn is leading groups of students to see the several important scrolls, including 11QPsa and 4QMessianicApocalypse, on exhibition in San Diego. He is Associate Professor of Biblical Studies at Azusa Pacific University and is working on a book on the literary genres of the Old Testament.